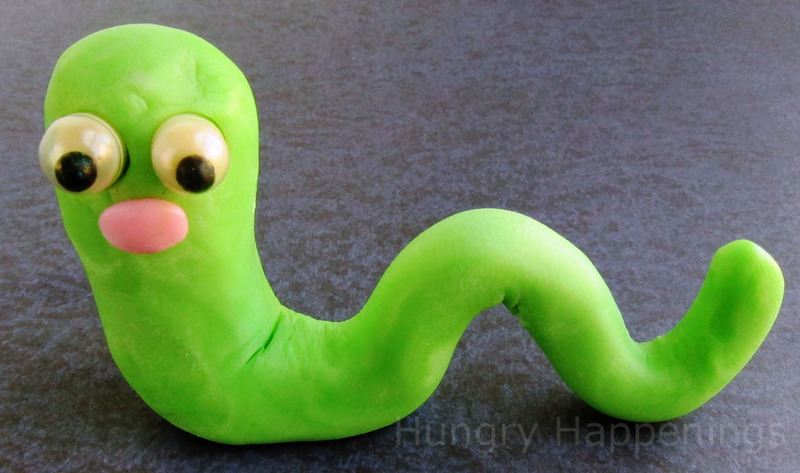 Add edible googly eyes to your modeling chocolate and fondant figures. July 11, 2011 By This post may contain affiliate links. 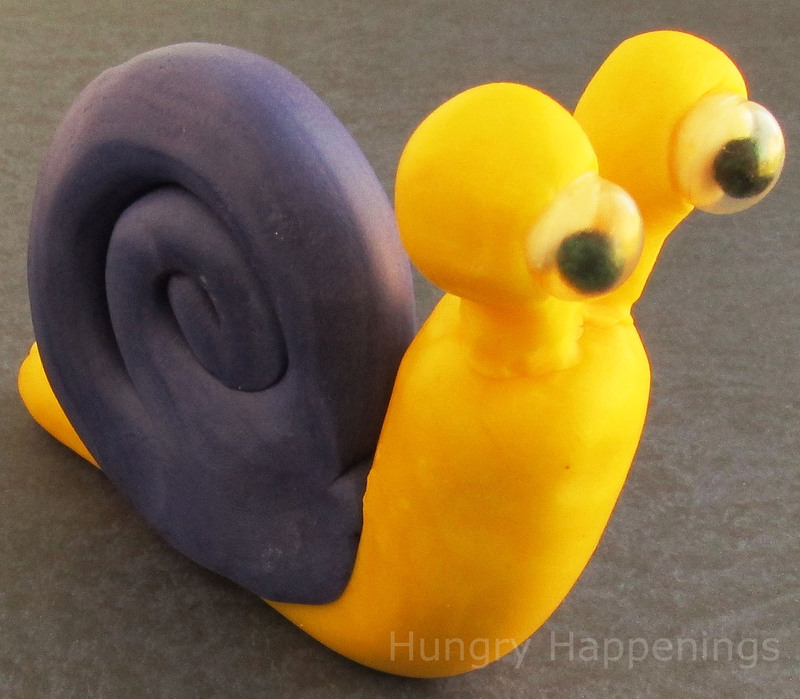 Bring your creations to life when you Add Edible Googly Eyes to your Modeling Chocolate! 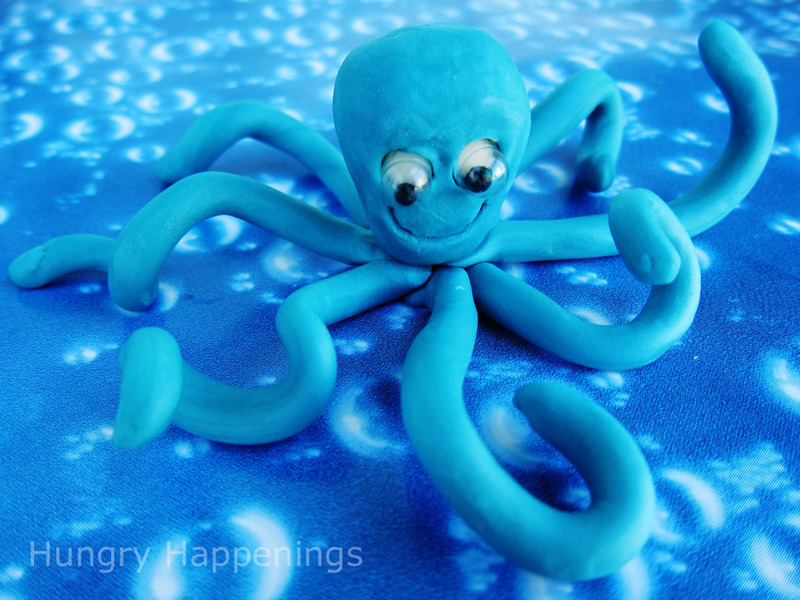 Make any creature you like and have fun getting creative with your kids! 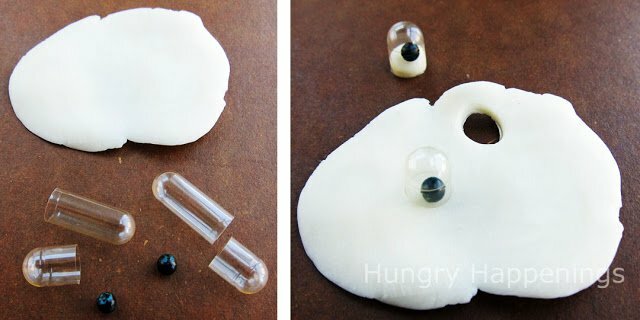 A few years ago I came across a tutorial on making edible googly eyes out of gelatin capsules and edible sugar pearls (large non-pareils) over at Evil Mad Scientist. I thought the idea was truly brilliant. They used the eyes, pressed into a malted milk ball, to adorn a Flying Spaghetti Monster which was made out of white chocolate coated chow mein noodles. 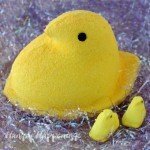 So cute and so easy to make. 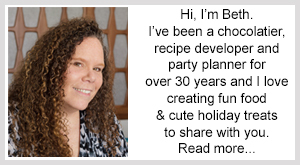 I knew that someday I’d want to make use of the edible googly eyes, so I stored the idea in the far reaches of my brain – oh, and added the website to my favorites list, as I find the computer is much more reliable than my middle aged memory! 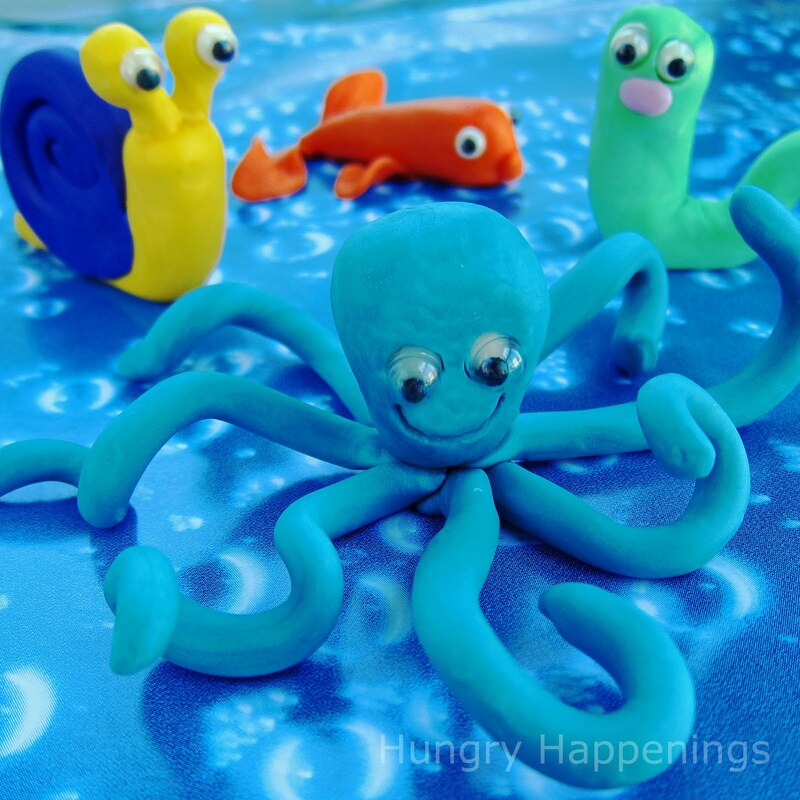 Last week I started working on summer recipe ideas inspired by the ocean and decided to sculpt some sea creatures out of modeling chocolate. When it came time to add the eyes, I did, miraculously, remember the edible googly eyes tutorial and knew that my sea creatures would look so cute with the addition of these silly eyes. I just needed some gelatin capsules, so I made a quick trip to the health food store. I followed the Evil Mad Scientist’s instructions on making the eyes by cutting a few of the capsules and adding some black edible sugar pearls . To my dismay, the eyes didn’t wiggle and were kind of lost on the face. After playing around a bit, I determined it is best not to cut the capsules to give the eyes more room to wiggle, and that adding a bit of white modeling chocolate makes the eyes more prominent on the face. My sea creatures really came to life once I added these silly wiggly eyes. 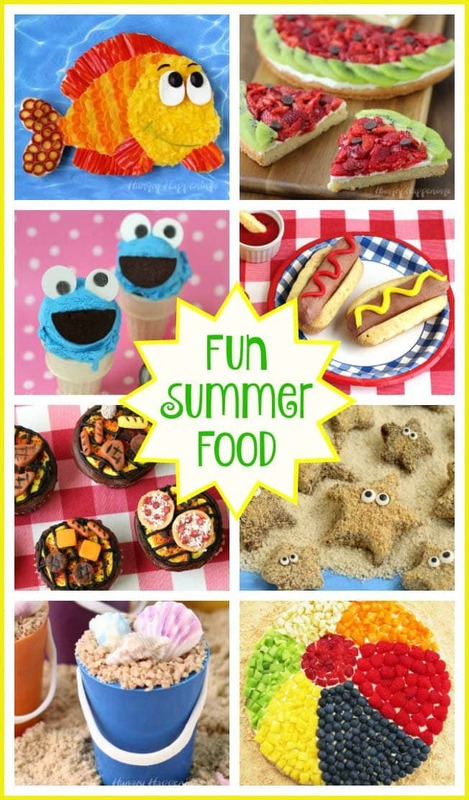 They would be a whimsical addition to any summer themed party. 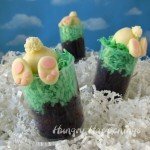 If you make these cute characters using white modeling chocolate which tastes much like a vanilla Tootsie Roll, then you can serve them as individual treats. You can, if you prefer, sculpt your animals out of fondant and use them to decorate a cake or even cupcakes. Gelatin capsules come in many different sizes, so you can make eyes the appropriate size for your sculptures, just choose the right size sugar pearls or non-pareils to fit in the capsule. This technique can be used to create eyes for any sculpted animal, human, or creature. 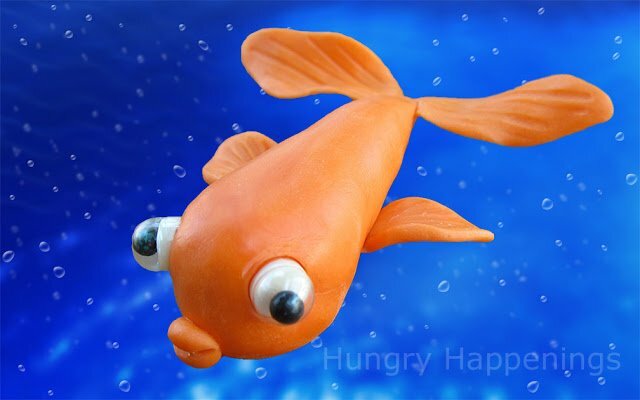 This post is really about sharing the method of adding googly eyes to your sculpted pieces, but I will show you step-by-step instructions to create a goldfish out of modeling chocolate. I am, admittedly, not the best sculptor. I have giant hands, great for swimming, not so good for sculpting small pieces. Fortunately, there are so many talented cake decorators (and clay sculptors) out there that have wonderful tutorials on sculpting figurines. Just do a search for the animal you want to make and I’m sure you’ll find the instructions. CAUTION: REMOVE THE GOOGLY EYES BEFORE ALLOWING A YOUNG CHILD TO EAT YOUR MODELING CHOCOLATE ANIMALS. Although the eyes are completely edible, they can pose a choking factor to a young child. Flatten or roll out a small amount of white modeling chocolate. Pull the two pieces of a gelatin capsule apart. You can use the large end of the capsule if the head of your modeling chocolate animal is thick (like the octopus or fish), but use the smaller ends otherwise (for the snail or sea serpent.) Set one edible black sugar pearl on the modeling chocolate. Place a capsule over the black pearl and press down gently. To help facilitate the removal of the capsule, lift up the modeling chocolate and use your finger to press up against the underside of the modeling chocolate where the capsule is placed. Then peel the capsule away from the modeling chocolate. You will get a nice clean cut and very nice round whites for the eyes. Can you see how there is a lot of room for the black pearl to wiggle in the capsule? Once this eye is pressed into the modeling chocolate animal’s face, the white will move up into the capsule slightly. That is why it is important to have plenty of capsule length to work with. 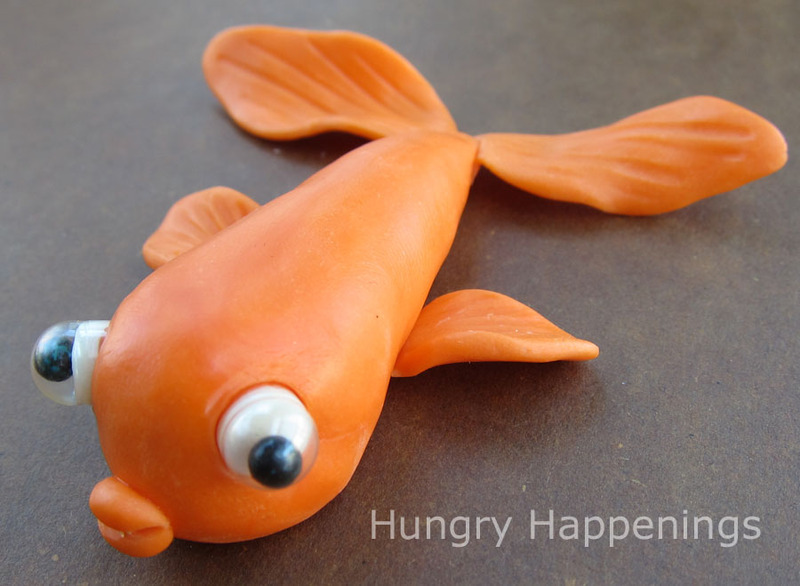 Pinch off pieces of modeling chocolate to create your goldfish. You’ll need one large ball rolled into a long oval shape for the body, two medium sized balls flattened and formed into ovals with pointed ends for the tail fins, two smaller versions of the same for the pectoral fins, and two very tiny balls rolled and formed into half moons and pinched together to form the mouth. If you want, you can use another medium ball of modeling chocolate to make a dorsal fin for the top of your fish. The actual size of the pieces will be determined by how big you want your finished fish. You can, if you want, use a veining gumpaste tool to quickly add some texture to the fins. You can also use a toothpick to create a similar effect. Attach the fins and mouth to the body using a small amount of water. Press the eyes into the fish on either side of it’s head. Push just far enough for the eyes to stick but not so far that the sugar pearls wont wiggle anymore. When I made my first fish, I used blue sugar pearls, but in the end liked the black pearls better. Allow your fish to dry for a few hours before moving. Don’t plan to move your fish around very much as the tail fins can break off very easily. If you are making a cake or cupcakes, you might want to set the fish in place before attaching the tail fins. These modeling chocolate fish will keep for up to a month if kept in an airtight container, but are best served within a few days. I just love this octopus. When I decided to do this blog post, I didn’t have any really use for the sea creatures, so they are sitting on a shelf in my kitchen. They make me smile every time I pass by them. Which of the sea creatures do you like best? I love these! Definitely on my to-do list this week, just because they look so fun! You can usually find the gelatin capsules at health food stores, but I bet you can also find them at a pharmacy. I'm actually working on something for Valentine's Day that could either be put on a stick or on top of a cupcake. I'll have it posted in a few days. Wow – pretty cool! Definitely pinning! 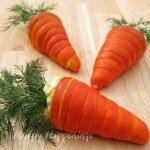 Bonjour…Je veux te remercier pour toutes ces jolies recettes que tu partages avec nous. J'apprécie beaucoup ton blog, il est super. Félicitation pour toutes ces magnifiques réalisations. Bonne journée…!!! Edible googly eyes! Honestly you have the best ideas! Can't wait to try some of them. 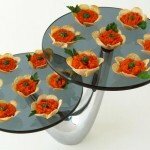 These look great, very clever. Although as someone who hates swollowing tablets I know trying to eat gelatin caps it is like munching a tough plastic. 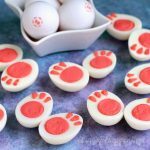 I came across these edible googly eyes online http://www.ediblegooglyeyes.com.au Hopefully they are in stores in the future. 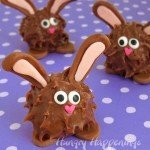 Thank you for the awesome and easy modeling chocolate recipe!! I have a quick question. I need to make figures out of modeling chocolate in advance. How do I store these figures?? First time making figures-please help!! You are welcome. I’m so glad you are having fun making figures. It is best to store them at room temperature in a cool place that is about 72 degrees F or lower. Keep it away from windows. You can store them in zip top bags or put them in airtight containers. Just be sure you don’t store them with anything moist like a cupcake in an airtight container or the modeling chocolate will get sticky.